I can't advise you on welding. I watched an instructional video six times (Flashdance, starring America's favorite welder: Jennifer Beals) and I still don't have the hang of it. 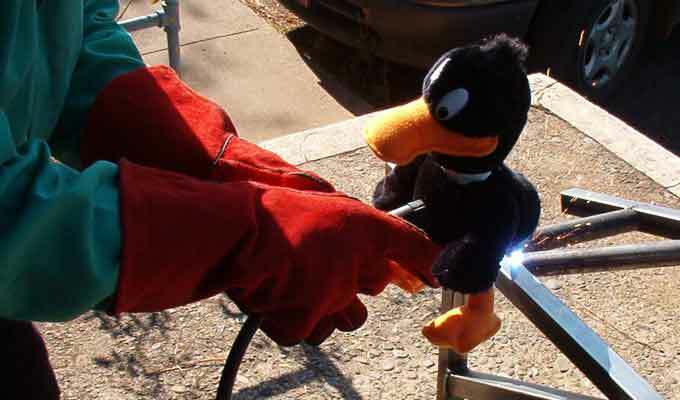 I do Mallard Injected Guano (or "MIG") welding, using special tools as you can see. It's good enough for test fixtures and test samples—in fact I prefer my own work for test samples, because you're not likely to find worse welding than mine, and ideally one tests the worst case—but it's not good enough for you. All the welded parts we sell are welded by professionals. So don't panic when you look at our test photos; your parts won't look like that. The best advice I can give you is, if you're interested in this sort of car, buy "the book" (Chris Gibb's Build Your Own Sports Car on a Budget, ISBN 978-1-84425-391-3) and read it. We sell it (near the bottom of the <Locost parts> page), Amazon sells it, your favorite bookstore can get it, and without it you won't make much sense out of the commentary on the Locost groups. The next book for your collection is Keith Tanner's How to Build a Cheap Sports Car, also availeable darn near everywhere and especialy from us. As an alternative (or better yet, a supplement) <locostusa.com> hosts an active forum with a more modern format; plenty of good information in an easy-to-navigate package. As far as our own contribution to the knowledge base, well...below you'll find bits on suspension prep, a light smattering of fiberglassing, and a heavy smattering of windshield installation. Also you'll find some rambling about why we went to straight control arms years ago, and our current efforts on quick adjust control arms, and some low budget structural test procedures and results. Ron Champion's Build Your Own Sports Car, ISBN 1-85960-636-9 used to be "the book" but it's out of print now.